Inspired by personal family experiences, The Yellow Suitcase allows the reader into a very intimate moment in time: when a family grieves the loss of a beloved grandmother. Told from an #ownvoices perspective, this is also the story of a family living in two cultures, traveling from America to India to say goodbye and experience the many faces and feelings of mourning. 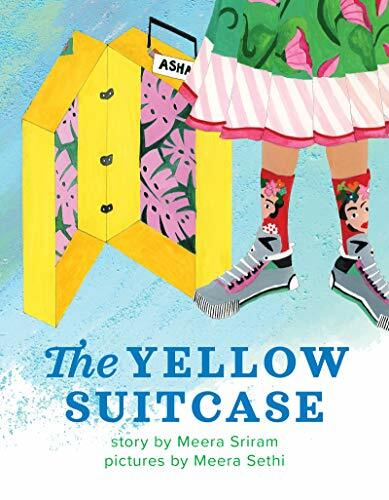 A central character in this story is the yellow suitcase, symbolic of the loving relationship between a granddaughter (Asha) and her grandmother. Annual summer visits to India meant a suitcase filled with gifts for grandmother, and in turn from grandmother as Asha returned to her home in America. On this occasion, however, an empty suitcase highlights those empty and sad feelings of grief and how there would no longer be an exchange of gifts. Sriram’s tale fills the senses (“she could smell Grandma’s talcum powder;” “the scent of jasmine flowers and incense smoke stung Asha’s nose as she walked closer to Grandma’s picture on the wall shelf”) and has strong visual impact (“Grandma’s marigolds swayed in the evening breeze”). Meera Sethi’s illustrations are colorful and textured and playfully capture the cultural life of the Indian-American family. The younger reader, however, might need some extra time to relate to how Asha is depicted—seemingly older-looking that what one would expect to see in a picture book main (child) character. In the end Asha has a surprise in store. Her grandmother has left her a final, precious gift to take home to America. Using bits of her own saris, before she died Grandma stitched her love into a quilt for Asha, “rectangles of red paisleys and green leaves, and squares of blue flowers and maroon swirls.” The yellow suitcase is now filled with Grandma’s love, and Asha’s grief is somewhat softened by the smell and feel of her Grandma’s saris. The Yellow Suitcase is truly a touching glimpse through a multicultural window into what would otherwise be a very private world. Michael Genhart PhD is an author of picture books for children. His most recent title is Love Is Love (Little Pickle Press, 2018).